If you’re not a fan of the hyper-hummable, foot-tapping and resoundingly shallow hits of the Swedish ‘70s rock band ABBA, you might not be the natural audience for the musical cobbled together from them, Mamma Mia, now playing in Houston as a touring show at the Hobby Center. Then again, if you’re at all like me, you might be surprised. Given context by a not-so-silly story about a young, soon-to-be-married woman’s efforts to figure out which of three men her mother slept with on a Greek island in the late 1970s is her father, songs that made no particular (or pleasant) sense like “Take a Chance on Me” or “The Winner Takes It All” at least-at last grab onto identifiable human emptions. And since most of the people seeing the stage musical now have also seen the big-name Hollywood movie – besides knowing most of the songs by heart – there is very little pondering going on in the tirelessly delighted audience. It’s a chance to realize (again) that whenever a show tirelessly delights an audience, it is doing a lot right. In the current production, the joys fall much closer to those of the musical Grease than might be expected. The entire running time, besides suggesting some lovely Greek island scenery that the shot-on-location movie showed better, is a sequence of “boy songs” and “girl songs,” with some energetic choreography thrown in. Think: “Summer Nights,” “Greased Lightning” and all the rest, except set to the never-raunchy tunes of ABBA. A song like “Take a Chance on Me” has to be made suggestive by a lighthearted seduction scene, since otherwise it sounds like happy circus music. 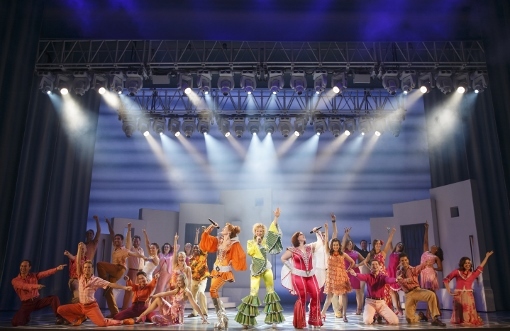 Mamma Mia is simply fun, from start to finish – and what insights the show offers about life and love come more from the storyline than from the familiar lyrics. Also, as in Grease, there’s room to shine onstage for both grownups and kids – even more than in Grease, really. In lieu of that 1950’s musical’s high school administrators, teachers and coaches (who always seem silly through a teenager’s eyes), the grownups in Mamma Mia grapple meaningfully with the consequences of choices made long ago, even when those didn’t feel like choices at the time. The fact that the kids – the bride, her groom, her friends and the staff of her mother’s small island hotel – are making many of those same choices now adds poignancy to the story. All the cast impresses with energy and eternal youthfulness, especially in dance numbers that occasionally run Dirty Dancing through the filter of Zorba the Greek. 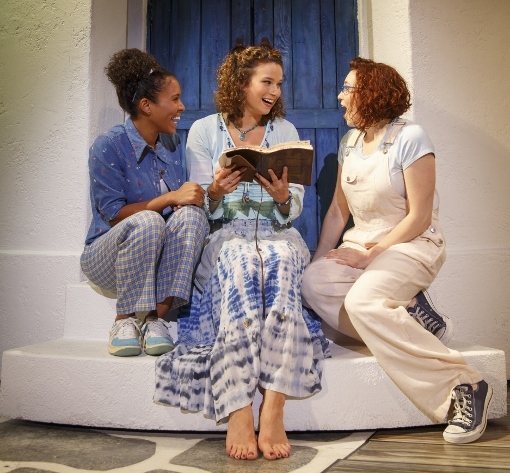 Particular attention goes to Georgia Kate Haege as Donna, the woman whose romances on this island handed her a life, along with Chelsea Williams as her daughter Sophie. The audience also responds enthusiastically to Baily Purvis and Sarah Smith as Donna’s two girl-group singers from the ‘70s, reuniting with humor and songs like “Dancing Queen” for Sophie’s wedding. Since Mamma Mia is a chick-flick performed live, the guys in the cast get more singing and dancing than acting. Still, Michael Colavolpe, Jeff Drushal and Andrew Tebo handle their roles as the three possible fathers with conviction and implied decency.